Normally I’m not a big fan of wallpaper. 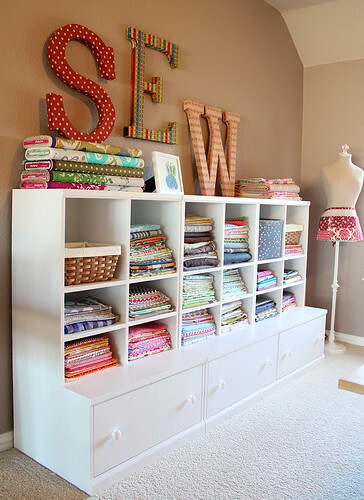 I like the colors and prints of wallpaper, almost in the same way I like the colors and designs of fabric but I had a bad experience once, trying to remove it from our bathroom walls after moving in. I ultimately failed and we had to hire professionals to finish the job because it was just not coming off. 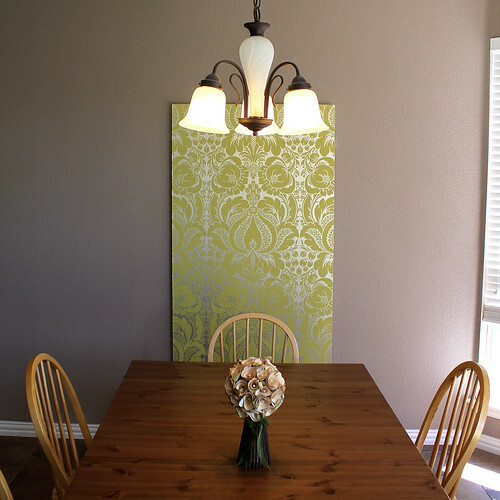 But when the giant blank wall behind our kitchen table was begging to have something put on it I decided to give wallpaper another chance – in a small dose. 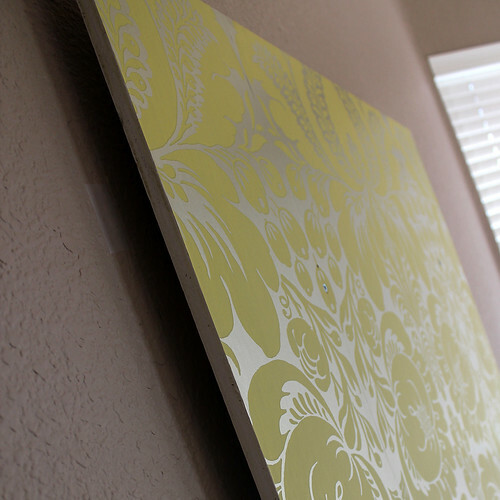 I got a large board (3′ x 5′) which just barely squeezed into the van, painted the edges white and wallpapered it. 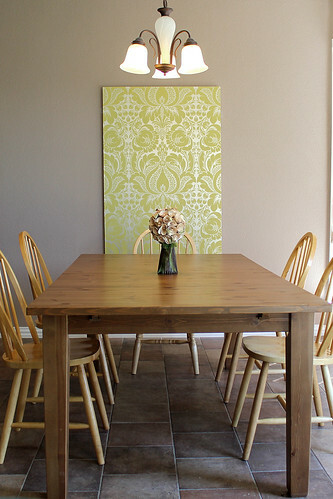 It sounds easy, but this job took hours – getting the wallpaper to hang straight on the board, then trying to get the board to hang straight on the wall. I like to think I’m handy with tools, but sometimes it’s still a challenge. 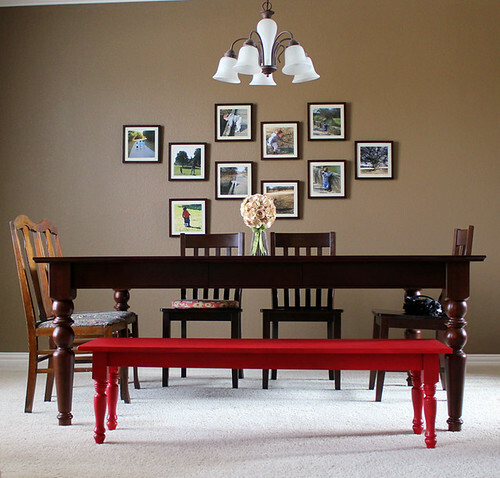 The wood is actually anchored to some pieces of wood behind it so it isn’t flush on the wall – sorta like art. Since the table was clean, I took a few extra pictures. I happy with how it turned out. I originally wanted to hang pictures on and around the board, but I’ve decided I like the simplicity of it. 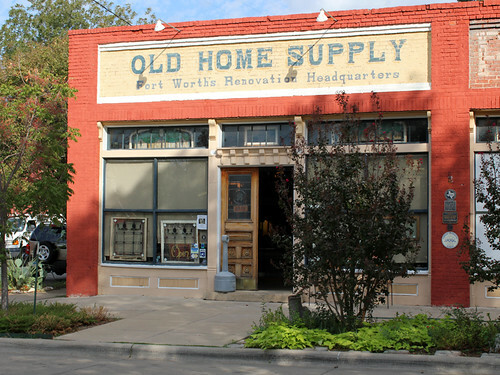 We have a nice little architectural salvage shop in downtown Fort Worth that I just adore. It’s busy and packed full of all kinds of things and a fun place to go and poke around. Not everything has a price tag which makes me nervous heading up to check out with my things. My latest score: a $5 corbel. Yep, I sighed a big silent sigh when they named the price. I would have liked to get 2, but there was only one. It’s pretending to hold up my new laundry room shelf. The real brackets are hidden behind the washer. Yep, decorating, not remodeling – there won’t be any new cabinets or anything big – just a little touching up here and there. 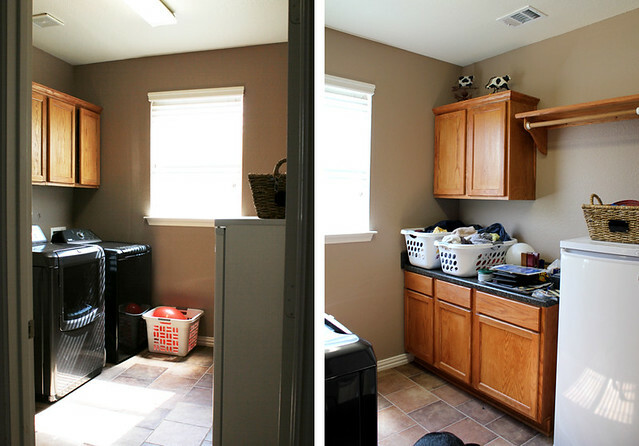 The size of this laundry room was one of the big reasons I fell in love with this house. It’s bigger than any laundry room we’ve ever had but it could definitely use a little style help. The most obvious thing to me is that the balloon in the laundry basket needs to go. I mean, really, who keeps balloons in their laundry room? Not me. 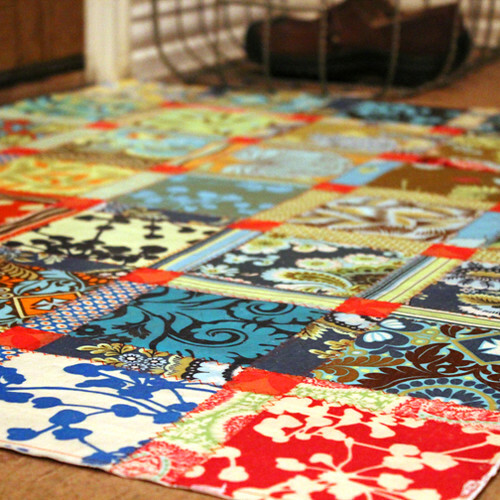 Beyond that there are several things I’d like to tackle but my first step was the floor: I made a floor cloth to give the room some fun. I’ve really enjoyed my first one, and had to try it again. 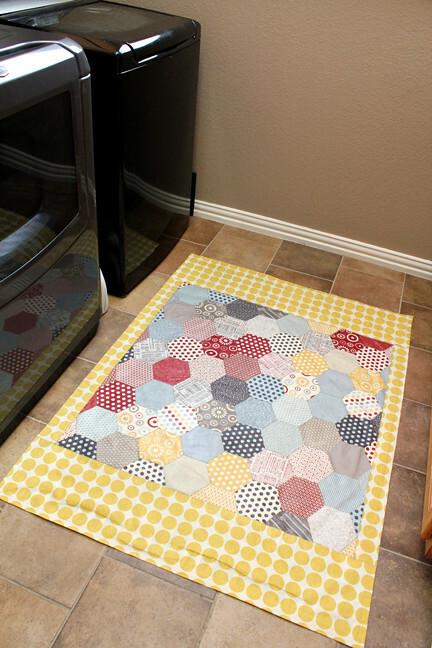 The hexagons were cut from a layer cake of Sweetwater’s Hometown fabric. It’s stiff and sturdy and won’t slip around thanks to paint on rug backing. I’ve been building up an album of laundry rooms I like on Pinterest, but the challenge will be making my dark machines look nice. Almost every beautiful laundry room has light-colored machines. We moved into our house 5 months ago. FIVE MONTHS! And piles of frames were still all over the house. My excuse is that the house needed to be painted first. But that was done last month so really I have no excuse. Finally, with Joanna to help me, my stuff is hung! Everyone should have a sweet sister that helps them get things done. 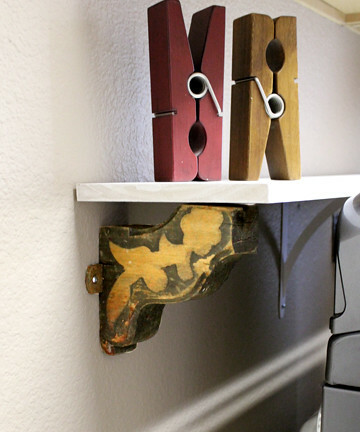 She showed me this nifty trick for hassle-free hanging – you’re a genius, girl. We cut out paper the size of the frames and folded them in half, marking the midpoint. 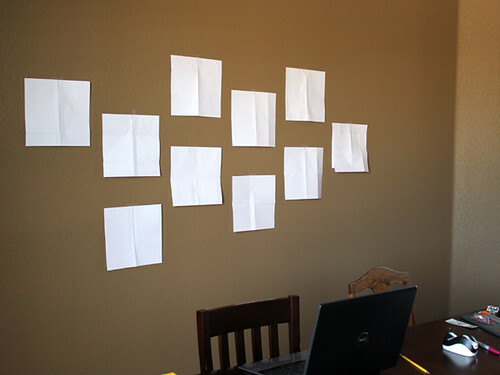 I taped them up until I liked the arrangement, then used the midpoint to mark the spot to nail into the wall. Also got a little piece of artwork hung above my craft room door. It’s RED! 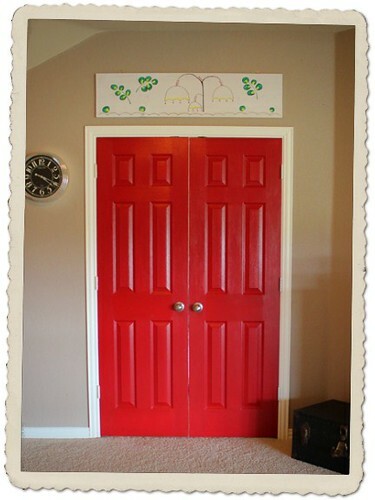 I really wanted a red door someplace in the house and I’m so happy with it. Red is my happy color. Everyone should have a door in their happy color. Do you have a happy color? Way back when I was going through my charm pack phase, I put together this little wall hanging. It hung in the same spot until we moved, but by then, I had a new plan for it. A friend had passed on a copy of Mary Janes Farm Magazine and in it were instructions for making homespun canvas floorcloths, perfect for my charm pack wall hanging thingy. Now I have a new rug by the front door. 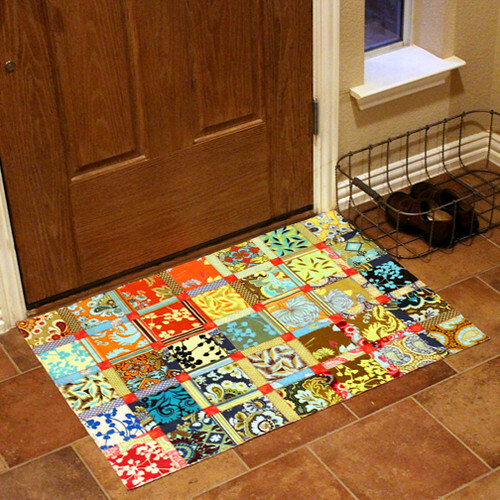 The nice thing about this rug is that it’s flat, so it doesn’t get in the way of the door opening. It’s also sweepable and doesn’t hold dust, so doesn’t need to be vacuumed. My ingredients? 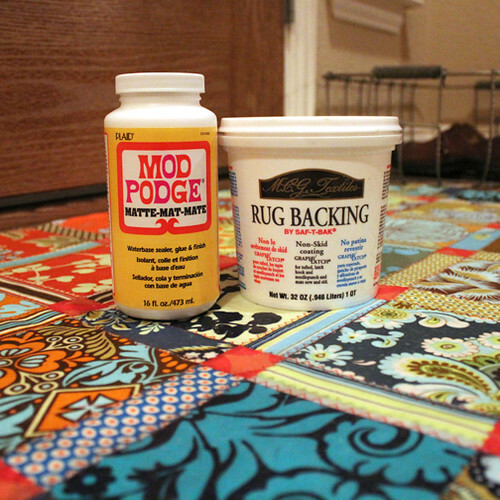 2.5 bottles of Mod Podge to glue my 3 layers of fabric together and a fantastic new find: rug backing. Rug backing is painted on to the bottom to keep the floorcloth from sliding around. I can see all kinds of uses for this.